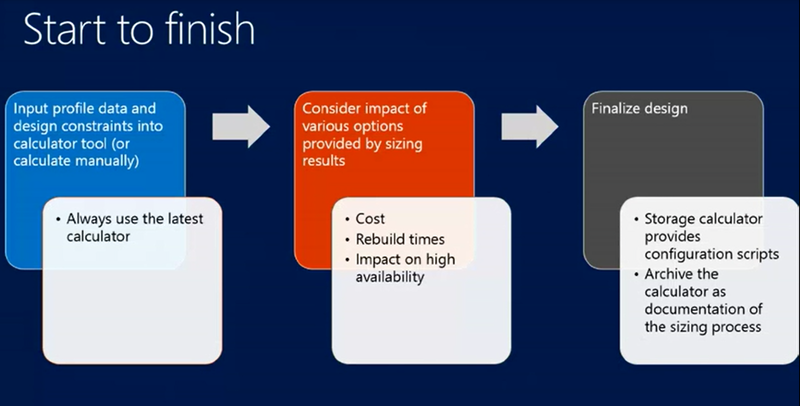 If you are migrating or planing to deploy Exchange 2013, you may want to know about what are the small changes that affect your capacity planning. This post will help you quickly get an overview about those changes, in order to do a more accurate capacity planing. Mailbox Role : consolidates most Exchange components. CAS Role : is an effective stateless proxy. Active Directory : Exchange depends heavily in AD and you should have enough hardware for AD to support this heavy dependency. Exchange 2013 contains built-in performance motioning components: Exchange Diagnostics Services (EDS) that collects performance data to be used by Microsoft engineers in case you open a support case, capacity planning, sizing guidance, or for performance bug detection. This is enabled by default. There are also many other logs that are enabled by default. All of this requires lots of space on the install drive of Exchange 2013 server. A minimum of 30 GB Free space is required on the install drive. Finalize the design and do documentation. Rather than having set of roles in the product that use hardware in different ways and that not necessary use all the hardware on the server in the best way possible, instead now we have smaller number of roles that ideally use all the hardware that is available to that role in a balanced way. Roles are loosely coupled and scale independently. The whole idea here is that the Mailbox Role now consolidates most Exchange components, and Microsoft is pushing towards consolidating CAS Role with Mailbox Role ( also called Building Block Architecture). In this way, all the hardware available to the server will be used more efficiently. Most of Exchange 2013 components are now hosted in the new Mailbox role. Microsoft also recommends to collocate the CAS role with the Mailbox role to utilize hardware resources even better. 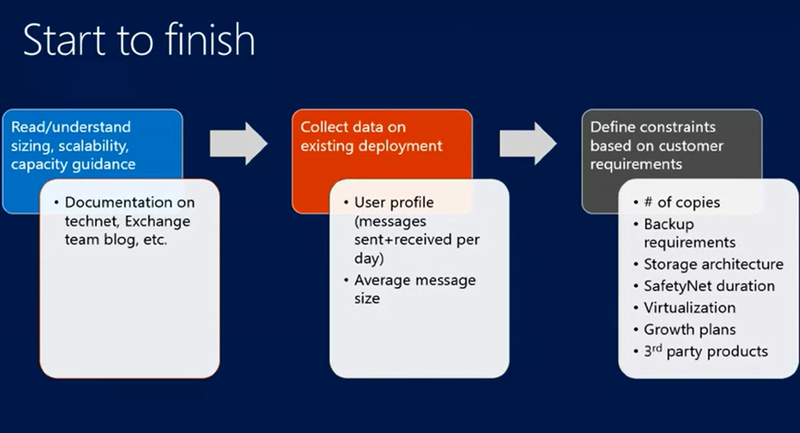 The new Mailbox role provides simplified deployment and connectivity model. Less roles to provision and worry about, and less network packets between the old multi roles Exchange servers. The new Mailbox role also provides balance resource utilization and hardware efficiency, because instead of spreading roles between different servers, roles are now consolidated. Cache effectiveness: In previous Exchange architectures, processing and email traffic for a particular user could occure on many servers through the topology, so if i am opening my email from outlook and ActiveSync, then i may have two CAS servers processing my request. So my cached data stored on the servers would become useless as soon as those connections moved to other servers. In Exchange 2013, all workload processing for a given user occurs on the Mailbox server hosting the active copy of that user’s mailbox. Therefore, cache utilization is much more effective. The new CAS role is now completely stateless proxy from a user perspective, so it becomes very easy to scale up and down as demands change by simply adding or removing servers from the topology. Compared to the CAS role in prior releases, hardware utilization is dramatically reduced meaning that fewer CAS role machines will be required. On the other hand, Content Index (CI) size is now 20% of the EDB + space for additional index set per volume (use for master merge maintenance process). So if you have multiple databases per volume, you will have only one additional index log set. So by having multiple DBs per volume, you will save space that would other wise be consumed by the master merge log set. The master merge indexes are computed as 20% of one of the databases on the volume. Content index = 20% from the database size. Master Merge logs : one set per volume = 20% of the average size of the databases on that volume. Storage bandwidth is about things crossing between the server and the storage system. Bottlenecks were caused by the Background Database Maintenance (BDM), and in Exchange 2013, BDM is now consuming 1MB/sec/DB copy, significant reduction from 2010. Voice mail transaction is a heavy consumer of CPU and now the UM is part of the mailbox role now. If a server is CPU starved, then the voice mail transcription may be skipped while the voice mail is delivered.